This free activity gives your students the opportunity to create a procedural text. 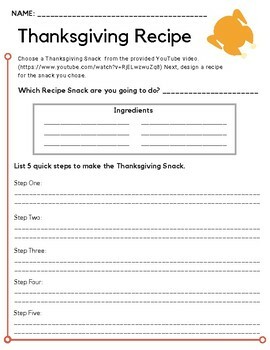 Students will watch a quick YouTube Clip of various Thanksgiving snacks. Next, they choose a snack and formulate a recipe card. The YouTube link is provided on the handout and here: https://www.youtube.com/watch?v=RjELwzwuZq8.